Set during and just after the First World War, The Lie is an enthralling, heart-wrenching novel of love, memory and devastating loss by one of the UK’s most acclaimed storytellers. 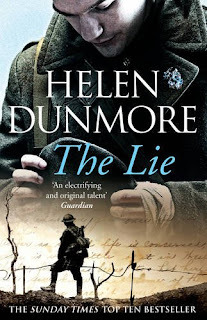 I do love my historical fiction although I am more used to reading about medieval kings and queens, but I was loaned this copy of The Lie, set during and after World War I.
Daniel has returned from the First World War and is haunted by the things he has seen and the friends he has lost. He appears to be quite happy in his solitude with his old friend, Frederick, never far from his thoughts. Frederick never made it back from the war and Daniel soon finds himself spending time with Frederick's sister, Felicia. They keep Frederick's memory alive as the reminisce about old times. Daniel's thoughts often return to the dreadful conditions in the trenches and we are given glimpses into what life was like for a 'Tommy' on The Front. Daniel also has his personal demons to overcome and his guilt and deep personal loss surrounding Frederick's death. I really expected to love this book but I neither loved it nor hated it. I just didn't experience any positive or negative feelings as I progressed through the book. I should have been crying my eyes out at the end but unfortunately I hadn't built up any feelings for Daniel at all. It's not a bad little book for a weekend, but it isn't a book I would recommend. It has not, however, put me off reading other Helen Dunmore books and I will be sure to take a look should one cross my path again.